In Cologne 2018 we showed a firehouse with satellites inside. 2 satellites in each corner inside rules the trucks when they drive in and where to go on the first free of the 3 lanes. The satellites are small enough for H0 buildings and if necessary they can be dismounted from the house. In this case the firehouse scenarios is like a small 2D fiddle yard set-up. 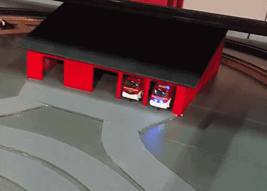 Take a look at the video to se how it works on the layout in Cologne.